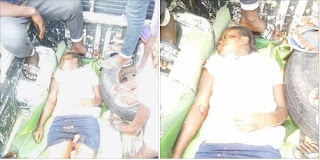 A tragic accident that happened yesterday has claimed the life of a promising young woman in Bayelsa. A young woman has died a tragic death after she was killed on the spot by a speeding tipper. The sad incident happened on Tuesday (yesterday) in Bayelsa state. The deceased and her elder sister were on a motorcycle otherwise known as Okada before they were hit by a tipper along Otuogori and Otuokpoti road. It was gathered that two tipper drivers were trying to overtake each other along the road before hitting the motorcyclist and his passengers. The young lady died on the spot while her sister broke her hands and legs, according to an online report. It was also revealed that the Okada rider became unconscious after the accident and was rushed to the hospital where he is being treated.